Predeceased by a baby sister; brother Richard Knut (RCAF – 1945); mother Ida (Felt) Ourom; father Ivar Ourom; niece Susanne Radtke; and sister Dorothy Stewart. Survived by siblings Donald Ourom, Adeline Friesen, Iris Ourom and Vivien Radtke; many nieces and nephews; numerous cousins in Canada and Norway; and many friends and colleagues, particularly in Toronto. Raised in Battrum, SK, during the dust bowl and Great Depression, Lorraine showed academic ability early on. 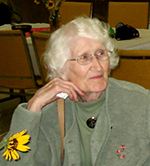 She went to UBC at age 16, receiving a First Class Honours BA in mathematics and physics in 1947. She was a scientific editor with the National Research Council in Ottawa until 1958, followed by several years with the UN in New York and Geneva, including work at the Second International Conference on Peaceful Uses of Atomic Energy. Lorraine settled in Toronto in the early 1960s and worked for the University of Toronto Press, ending her career as executive scientific editor, eventually retiring to Saskatoon. Lorraine enjoyed a vast array of hobbies including hiking, camping, skiing, canoeing, Scottish country dance, knitting, sewing, rug making, weaving, reading, travel and the symphony. She also pursued Arabic studies at the University of Toronto. Lorraine was a well-loved and generous supporter of her siblings and their many children, and will be greatly missed. Thanks to the staff of the Saskatoon Convalescent Home for their compassionate care. Donations in Lorraine’s memory to: St. John Church & Cemetery Association or to the Canadian Red Cross.